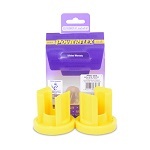 Powerflex: Manufacturer of the finest polyurethane bushings and components for you MINI Cooper. 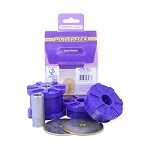 Replace the soft rubber with these polyurethane bushings to improve performance and reliability. The most popular Bushing is the front lower control arm bushings for the MINI Cooper. Powerflex also makes a great set of motor mount insert bushings for the lower motor mount, Gearbox, and early cars upper motor mount. Don't forget the powerflex steering rack bushing, rear trailing arm bushings, supercharger belt tensioner bushings or even front sway bar bushings too.